A year ago we commissioned a special Savonnerie carpet to be made by one of our suppliers. 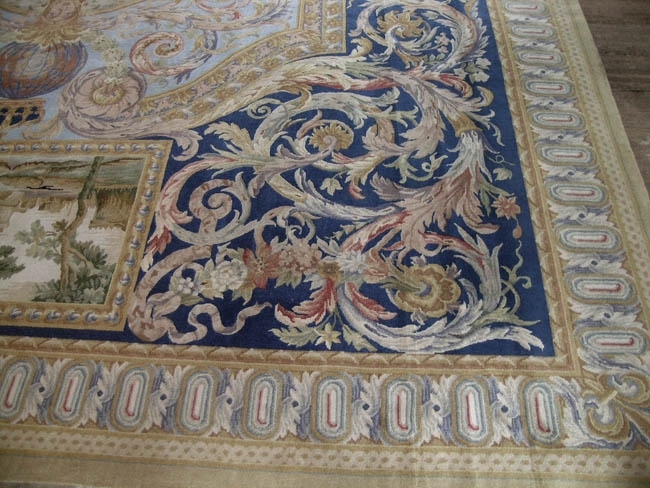 There are two types of classic rugs, the Aubusson, which is a flat weave and the Savonnerie which has a sheared pile. Savonneries are more expensive that Aubussons because they contain more wool and are harder to make. We have had a long relationship with a factory in China who makes both types of rugs. They also make Needlepoint and traditional "oriental" rugs. 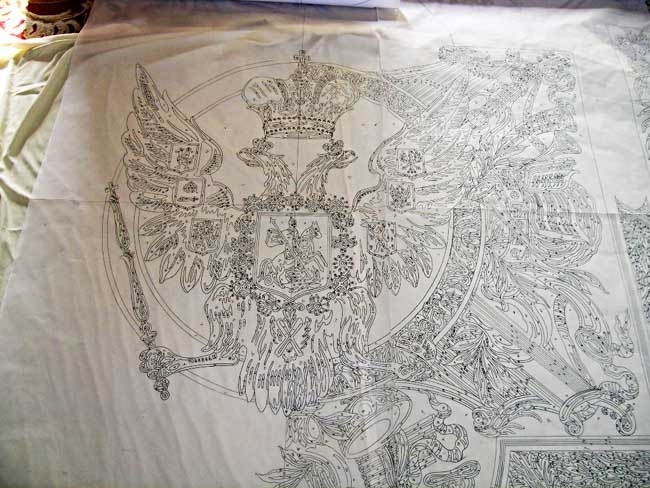 We took a design they already made - a rich Louis XVI design with flowers, acanthus and musical instruments - and switched the monogram of the French king in the center to the Romanov Double-Eagle. We didn't change two European-type crowns for Russian ones and we added two multi-colored scenes of castles at the top and bottom. These substituted for two unattractive grisaille scenes of mythological scenes. I could never quite make out what the grisaille scenes were exactly. They had something to do with reeds and cupids. We also changed the color in the background of the corners from black to a gorgeous Royal blue we took from plates that belonged to Catherine the Great. 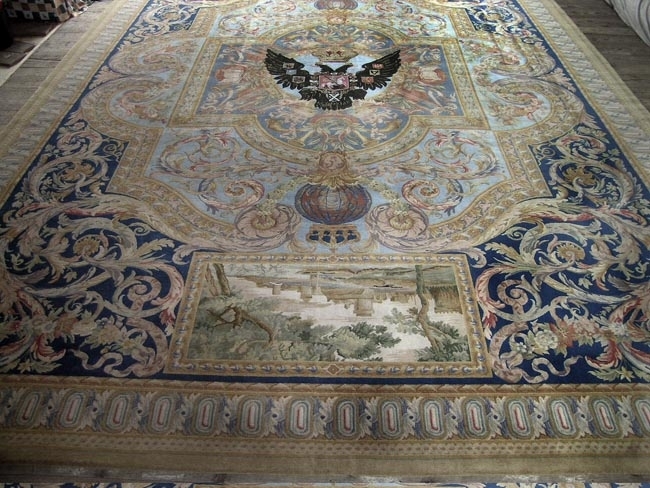 Here you can see the completed carpet - it is around 19 feet long and 13 feet across, we made it to fit a specific room. The nice thing about these wonderful carpets is you can make them any size you want. They are lush, rich and soft. The workmanship is amazing. Next they made the carpet by hand. The work took around 4 months to complete. 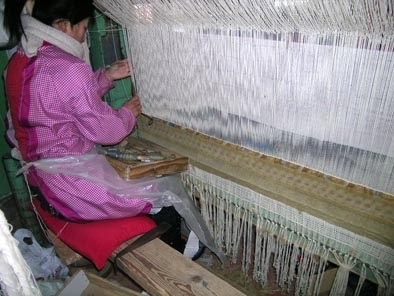 Here you can see one of the woman at the factory weaving. When the carpet was done I was sent pictures to approve before it shipped. We choose to ship the carpet by sea because of its size. You can order this carpet in many sizes. There are also many other patterns to choose from. They are made of the finest New Zealand wool. This carpet is $12,000 and is a special order. You can change the center emblem to whatever you want, such as the Habsburg eagle or the British Royal Shield. Smaller sizes are, of course, less expensive. 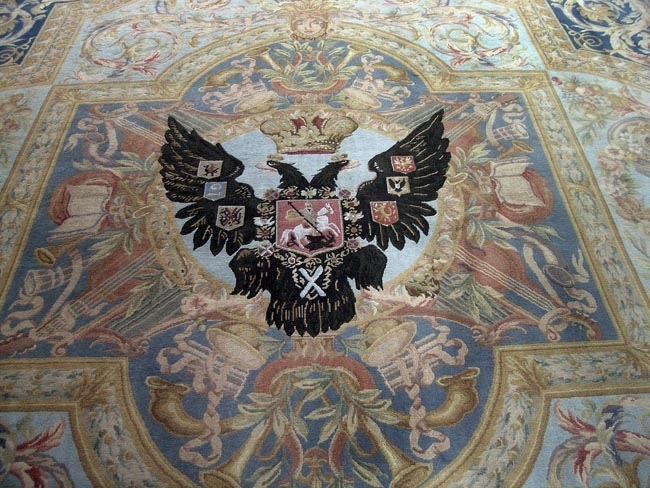 Call me at 512 469-7454 if you are interested in this specific Russian Imperial Romanov carpet - or some other design. There are more views of the rug below.